Christian Reading shifts the assumption that study of the Bible must be about the content of the Bible or aimed at confessional projects of religious instruction. 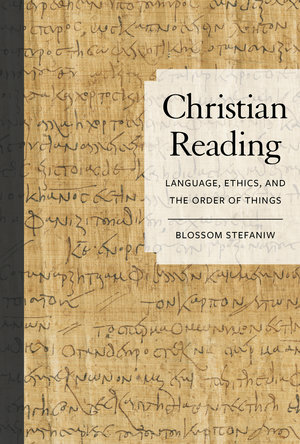 Blossom Stefaniw focuses on the lesson transcripts from the Tura papyri, which reveal verbatim oral classroom discourse, to show how biblical texts were used as an exhibition space for the traditional canon of general knowledge about the world. Stefaniw demonstrates that the work of Didymus the Blind in the lessons reflected in the Tura papyri was similar to that of other grammarians in late antiquity: articulating the students’ place in time, their position in the world, and their connection to their heritage. But whereas other grammarians used revered texts like Homer and Menander, Didymus curated the cultural patrimony using biblical texts: namely, the Psalms and Ecclesiastes. By examining this routine epistemological and pedagogical work carried out through the Bible, Christian Reading generates a new model of the relationship of Christian scholarship to the pagan past. Blossom Stefaniw is a Heisenberg Fellow of the German Research Council. She is the author of Mind, Text, and Commentary: Noetic Exegesis in Origen of Alexandria, Didymus the Blind, and Evagrius Ponticus.